Becky Lynch heads to the ring. The Man has something to say. Not long ago, no one was paying attention to her, but now everyone has an opinion on what The Man should do. Becky thinks the only thing The Man should do is to main event Wrestlemania. Her journey to Wrestlemania starts on Sunday when she faces Asuka for the SmackDown Title. Becky says she is better than Asuka, and Asuka never beat Becky for the title. Becky has already dethroned the Queen, and now she will break the Empress. Asuka interrupts The Man and heads to the ring. Asuka holds up her title and yells at Becky. As the two women argue, Charlotte Flair comes out and heads towards the ring. From the ramp, Charlotte talks about the choices she’ll have after winning the Royal Rumble. Charlotte says she has owned the women’s division over the last four years, and she is the main event. As Charlotte finishes, Asuka attacks Becky. Referees and officials run down to try to break up the brawl, but Becky and Asuka won’t be stopped. After a while, Becky throws Asuka over the announce table and whips her with her leather jacket. Becky continues to attack Asuka until she decides to leave. After a commercial break, we find Becky and Asuka brawling in the backstage area. Referees and official still attempt to separate them. The feud between Naomi and Mandy Rose is recapped in a strange, soap-opera-esque video package. This wasn’t much of a match. It looked like Rose has a miscue on one of Naomi’s moves, and the match was too short to be much more than an expected continuation of this story line. Rey Mysterio talks about winning the Royal Rumble. This Sunday is about making history, but tonight is about respect. Mysterio lost respect for Andrade when Zelina Vega caused a distraction in their match last week. Mysterio intends to teach Andrade the meaning of respect. The Miz and Shane are ready. This was okay, but it was more about trying to quickly build this feud rather than having a good wrestling match. Shane and Sheamus had a lot of activity at ringside, and that led into the finish and post-match shenanigans. After the match, Shane McMahon attacks Cesaro. Shane sets Cesaro up on the announce table and climbs a ring post. Before Shane can jump, Sheamus shoves Shane off the post and down to the barricade. Cesaro gets up and holds Shane for a Brogue Kick from Sheamus. The Bar then sets The Miz on the announce table and drives Shane through Miz and the table in a sort-of tandem powerbomb. 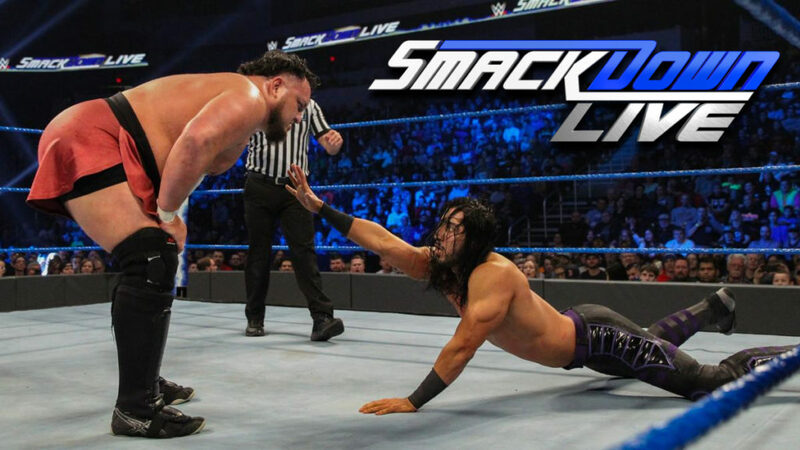 Last week, Samoa Joe attacked Mustafa Ali before they could have a match. Mustafa Ali talks about how his time as a police officer taught him that eyes don’t lie. Last week, Joe’s eyes told Ali that Joe thinks Ali is nothing. Now, Ali wants Joe to look into his eyes. Ali’s eyes show that when he says he can beat Joe, he’s not lying. Vince McMahon watches via TV as Miz and Shane are still being attended to at ringside. Vince McMahon heads to the ring. Vince is set to preside over a face to face confrontation between AJ Styles and Daniel Bryan. Styles comes out first, and he’s followed by Bryan. Bryan stops at ringside. He refuses to stand in the ring with a sociopath. He’s too embarrassed to step into the ring with Styles. Bryan has seen a vision of the future with Styles as champ, and it’s an ignorant, impotent, and illiterate future. Bryan says he uses his power for fame and money while Bryan uses his power for the greater good. Styles says Bryan talks like a jackass. Bryan says the people like Styles because he doesn’t make them feel guilty. But Bryan isn’t the people’s champ, he is the planet’s champ. Styles calls Bryan fickle for using an airplane to get to the show tonight. Bryan screams that he is not fickle. Styles goes on to say that Bryan isn’t embarrassed to step into the ring, he’s afraid. Bryan is afraid tonight, and he’s afraid of what will happen on Sunday. Styles says Bryan has corrupted his morals for the WWE Title, but what will happen when Styles takes the title away? Bryan will be left with nothing. Bryan begins to respond, but Vince stops him. Vince is tired of this and tells Bryan to get into the ring. Bryan says Vince and the baby boomer generation are parasites. Vince puts profit over people, and yet the people bow to him. Vince again tells Bryan to get into the ring. Styles says this is a face to face, but that doesn’t have to happen in the ring. Styles exits the ring and attacks Bryan. Styles beats Bryan up and rolls him into the ring. Styles sets up for a phenomenal forearm, but Bryan uses Vince as a shield. Styles hesitates which allows Bryan to hit Styles with a running knee strike. Smugly, Bryan exits the ring and heads up to the stage. R-Truth tells Carmella how excited he is to win the Royal Rumble and face either Daniel Bryan or AJ Styles. Carmella asks if R-Truth might want to challenge for the Universal Title, but R-Truth doesn’t want to go to Sioux Falls city. R-Truth walks off, and Carmella encounters Charlotte. Carmella explains to Charlotte how tough the Royal Rumble is. Plus, Carmella is number 30, and no one is getting past her. Regardless, Charlotte is confident. Very good match. Joe was dominant, but Ali go a lot of very good offense. Ali withstood a fair amount of punishment and still managed to hit some big dives, strikes, and moves. Ali had some very nice combinations. He was fighting angry, and even though Joe was never in a great deal of trouble, Joe did have to work in this match. I’d like to see them wrestle again. Andrade prepares for his upcoming match. New Day watches footage of Kofi doing a handstand in the Royal Rumble when Kaya Braxton walks up. Kayla asks New Day if they will be willing to eliminate each other in the Rumble. New Day says they are asked this question every year by every interviewer. Tony Chimel walks up and asks New Day the same question, but New Day dismisses him (since Edge isn’t here anyway). New Day is smart. They know that when one of them wins the Rumble, they all win the Rumble. Kofi is worried though. What if this is the year that he can’t keep his feet off the ground? Woods and Big lift Kofi’s chin. Literally. They have an idea, but we’ll have to wait for Sunday to find out what that idea is. This was another very good match. They revisited a lot of the moves from their previous encounters, but they also added a lot of new ones. Additionally, they were able to counter some of the moves they previously did. I like that sort of continuity and growth. Andrade and Mysterio showed that they are, in fact, human when they finally missed one of their big moves, but it didn’t matter much overall. This was highly entertaining. The finish was less than satisfying, but it does allow them to revisit this feud at a later date. After the match, Samoa Joe continues his attack on both Andrade and Mysterio. Joe gets on the mic and tells everyone that he came her tonight to make a statement. What he did just now, he will do to 29 men on Sunday. As Joe talks, Randy Orton appears and hits Joe with an RKO. This was a good show, even if it was a fairly standard pre-PPV show. Nothing was really settled tonight, and various statements were made. I liked it, but it left me wanting more (of most of it). So in that way, it definitely worked as a lead-in to the Royal Rumble. Despite the finish, this was still the best match of the night. I did enjoy Ali versus Joe as well, but it’s hard to deny that Andrade and Mysterio are fantastic together.